A beautiful island discovered by Emperor Augustus in 29 B.C., Capri is located off the Sorrento peninsula in the Bay of Naples of Campania region in Italy. Capri Italy, also known as Isola di Capri in Italian, is a gorgeous island untouched by pollution and contamination. The streets are filled with the aroma of jasmine, pine and citrus, the deep blue of the sea leaves a mark in the visitors mind and the ocean adds to the bliss. The entire island is a single block of limestone 3.9 miles long, 1.8 miles wide and encompassing a total area of 4 square miles. The island has less than 10000 people. Capri town: This town comprises half of the eastern part of the island, people can see a funicular rise into the center of the town from the Marina Grande port, ferries and hydrofoils disembark here. Piazetta or 'little square' is the centre of all activity. The beaches are hardly a stone throw away. Ana Capri: This place is located on a steep hill on an elevation of 980 feet. This place is not as lively as the other town of Capri. Graham Greene, the novelist lived here and his villa is conserved here to date. Arco naturale, matermania grotto - This place showcases an arch that is the remnant of a huge cavern that penetrated the mountain. This arch was uplifted in the Paleolithic age thus saving it from sea water erosion. A flight of steps underneath the valley lead downward to matermania grotto, a natural grotto later converted into a luxurious nymphaeum by the Romans. Capri by boat: Every visitor's tour to Capri will be complete only if they traverse the Mediterranean Sea by boat and explore it to the fullest. Most of the stretch of the coastline at Capri is inaccessible by land and can be best explored only by water. Capri - villa jovis: The main and important villa among the other villas of this island, Villa Jovis was built in the First century AD and was later rediscovered in the eighteenth century. The ruins of this villa were mainly rediscovered between 1800 and 1900; many pieces of remnants from this villa are housed in the archeological museum of Naples. Charterhouse of St.Giacomo: This house was founded in 1371 by Count Giacomo Arcucci of Capri and was supposed to have been built from the leftovers of the previous Roman buildings. Currently this place serves as a communal library and as a museum housing statues of the 1964 Grotta Azzurra cave extracted from the seabed. La grotta azurra: A 60 meter long and 25 meter wide cavity can be explored only using a boat, the entrance of the cavity is very small and thus you have to bend your head while you enter it. The cavity has a bigger entrance that has been totally submerged in water; this opening makes the water inside the cavern blue in color by reflecting sunlight. This place was rediscovered in 1826 by a German painter and from then has been attracting millions of tourists. The cave is a perfect place to play with acoustics, sing and you will see for yourself. Mount solaro: The highest point in this place, visitors can reach here by taking a walk or by taking a chairlift. Visitors can enjoy a panoramic view of the Gulf of Naples and Ana Capri while climbing up. Remains of a blockhouse built in the 19th century still stands here majestically speaking of the tales of war fought between England and France. Downhill visitors can take a look at the beautiful cetrella and its church. La migliera: This is a route that was built in the Roman times and served as a link in between Capodimonte and Migliera. Now this place is a beautiful walk in Capri with magnificent scenery and wonderful slopes of orchards. Villa san Michelle: This villa is located 327 meters above sea level housing the remnants of an ancient Roman villa preserved by Axel Munthe. Presently this place has been developed into a garden. 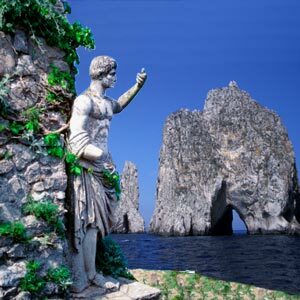 Capri Italy boasts of mild and serene climate. Peak season is between May and September. It is advisable to book hotels in advance. Winter sees fewer tourists and the tariffs at the hotels get reasonable too. Capri Italy can be reached by boat or hydrofoil from either Naples or Sorrento. From Naples the journey by ferry is around 80 minutes and by hydrofoil is 40 minutes, from Sorrento it takes about 40 minutes by ferry and 20 minutes by hydrofoil. Baggage is charged for separately and the ferry timings vary as per the company providing the services. Walking is the best way to explore Capri Italy, it is best enjoyed and the entire place can be covered to its best this way.